Satisfaction is a 56-foot Neptunus motor yacht which specializes in 2-person charters. The guest cabin is the mid-ship master cabin that has a Queen walkaround bed, TV/DVD player, and an ensuite bath with a stall shower and electric head. 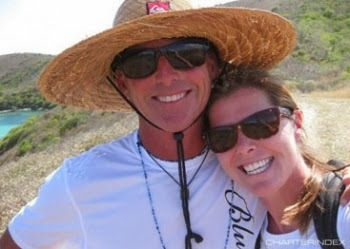 Satisfaction has one of our favorite crews, Rik & Ann Allen, former owner/crew of Sandcastle. Satisfaction is available for term charter as well as day sails. Children: No minimum age for children but must sleep with parents, included in daily rate. 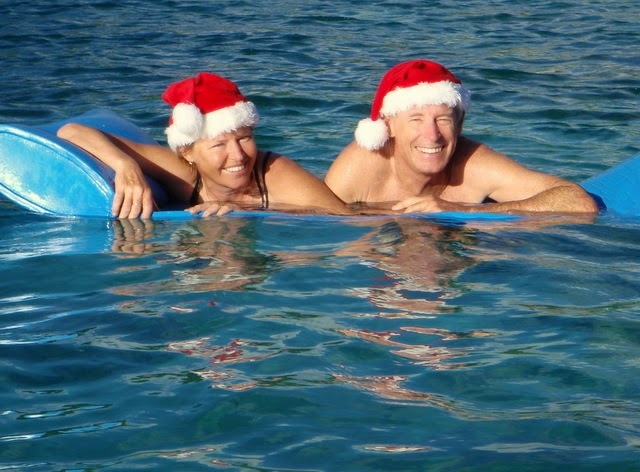 Christmas and New Years: $3,100/night for all-inclusive charter, except fuel. Two-night minimum. Please note that Satisfaction is a non-smoking yacht. Rik and Ann treated us like old friends. They were very helpful, and so much fun! We were a tough bunch--picky eaters (one vegan, one just picky) and they really worked with us to make us incredible meals. 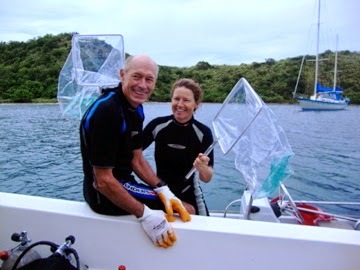 Also, one was 78 years old, one with poor balance….not quick getting around and in and out of boat/dingy, but Ann and Rik were always supportive and patient. Lots of fun playing Trivial Pursuit and euchre with them. We really felt at home on the Sandcastle. I took pictures, the presentation was so good! All vegan meals, and great variety. Really, really good food! And Rik is a fantastic bartender! 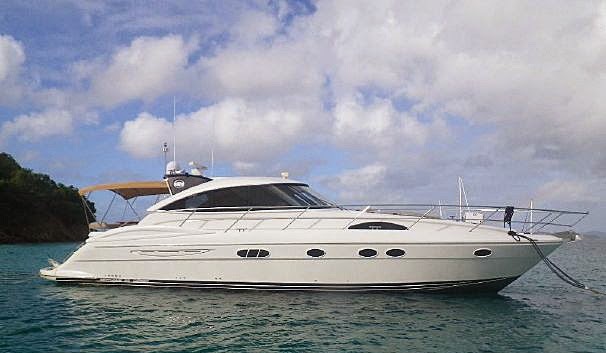 Many charter yachts will be raising their rates on 1st February 2015. 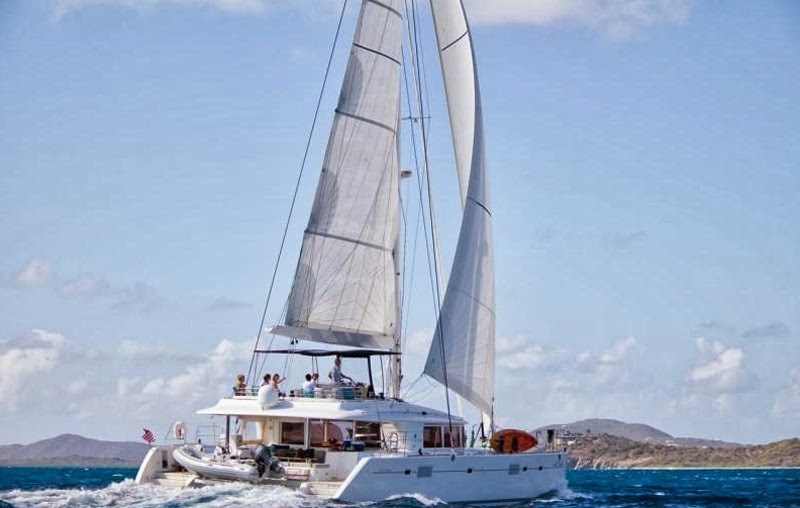 Book the 56-foot Lagoon catamaran Blue Moon and save over $1000 on charters taking place before July 27, 2015. Blue Moon is a 56-foot Lagoon catamaran with a crew of two. Blue Moon has a flybridge and is fully air conditioned. The catamaran accommodates up to 6 guests in 3 cabins, each with Queen berths and ensuite head/shower. Blue Moon has a 13-foot center-console dinghy with 60HP motor, waterskis for adults and children, tube, kneeboard, wakeboard, 2-person kayak, standup paddleboard (SUP), 6-person floating island, snorkel gear, fishing rod, hammock, satellite TV/DVD in salon, underwater camera, onboard wifi, iPod dock, etc. Blue Moon has equipment on board for 4 divers and offer 3 dives/week for certified divers at $100/wk/diver. 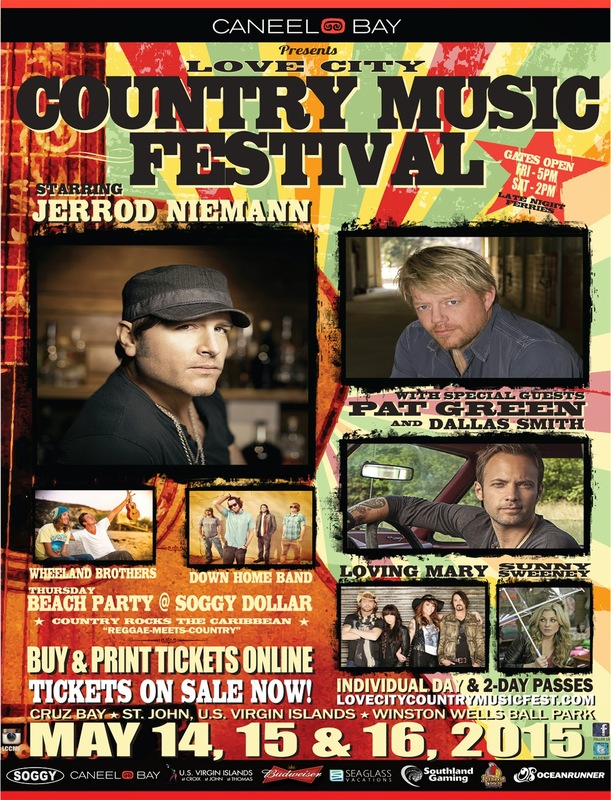 Have you heard that there is a country music event coming to St. John, USVI? Are you ready to two-step, island style? Country will rock the Caribbean at the first ever Love City Country Music Festival to be held 14-16 May 2015 on St. John in the US Virgin Islands.This three-day event, presented by Caneel Bay Resort, will have the island jammin’ to the tunes of national headliners and local bands alike in an all-out country hoedown! The event kicks off with the official festival beach party at the Soggy Dollar Bar on Jost Van Dyke in the British Virgin Islands, then boats its way over to St. John in the USVIs for a weekend jam-packed with country. The main stage is at the Winston Wells Ballpark in Cruz Bay, with satellite stages throughout the downtown area. Headliner Jerrod Niemann released his chart-topping major label first released in 2010 and has produced two platinum singles since: “Lover, Lover” and “Buzz Back Girl.” Special guests include Grammy-nominated Pat Green, Dallas Smith, Sunny Sweeney, Loving Mary, the Down Home Band, platinum selling singer/songwriter Jesse Rice, Travis Meadows, Hit Makers & Rum Chasers Nashville Songwriters Showcase, BMI Country award winner Levi Lowry, the beach country pop of Kaitlyn Weathers and the beach rock reggae of the Wheeland Brothers. More artists will be added. 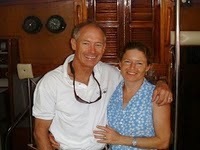 A charter yacht is a great way to participate in this event, plus you have time to sail before and/or after. We have a wide selection available so contact us ASAP to reserve your boat.